On April 18, 2006, the RWSA unveiled their preferred alternative, dubbed the "Ragged Mountain Reservoir Alternative", for the 50-year community water supply plan, covering years 2005-2055. Their recommendation, based on several major water supply studies, was to build a larger dam at the Ragged Mountain Reservoir, ultimately raising the water pool by 45 vertical feet. A new pipeline would be built connecting the expanded Ragged Mountain Reservoir to the South Fork Rivanna Reservoir. The Sugar Hollow Pipeline, which fills the Ragged Mountain Reservoir, would be retired, and water treatment facilities would be improved. The plan includes an environmental mitigation plan to address the impact on about three acres of wetlands and 14,500 linear feet of streams that will be flooded to expand the Ragged Mountain Reservoir. When implemented, the plan would allow additional storage and treatment of water for the urban water supply for times of drought and for needs required by projected population growth. The infrastructure construction would occur in phases during the next 15-20 years. The first priority is construction of the replacement Ragged Mountain Dam. This would be followed by an upgrade of the Observatory Hill Water Treatment Plant. RWSA would like to begin the pipeline construction process as early as possible once financing options are finalized. Much of the northern portion of the pipeline’s path is over existing roads or land acquired by VDOT in the right-of-way for the Western Bypass. The southern portion is largely on land owned by the University of Virginia. In June 2006, this water supply plan was approved by Charlottesville City Council and the Albemarle County Board of Supervisors. The U.S. Corps of Engineers and the Virginia Department of Environmental Qualityapproved permits for the water supply plan in 2008. In September 2007, the RWSA estimated the approved water supply plan would cost $142.1 million (in 2007 dollars). At the time of the 2007 cost estimate, the most expensive aspect of this project was expected to be the pipeline connecting the reservoirs at a projected cost of $55.9 million. The plan's costs also include other major initiatives to upgrade and expand water treatment systems. These projections were made in advance of preliminary engineering on the new dam and when the new pipeline connecting the reservoirs was only in the concept stage. Since the 2007 cost estimate, additional data has been collected about the underground environment and engineering requirements for a new Ragged Mountain Dam. In 2008, consultant Gannett Fleming prepared a revised high-end cost estimate for the dam project that approached $99 million (in 2010 dollars with contingency funds). This estimate included increases for the the dam’s foundation, that would have to be 40 feet deeper in some places. While the RWSA never accepted that as a valid estimate or approach, a second opinion was sought and a panel of independent experts was convened to evaluate the preliminary dam design. When that panel provided its assessment that a more affordable dam could be built, the contract with Gannett Fleming was terminated, and replaced by Schnabel Engineering Associates. The pipeline alternative not receiving the community's support was to utilize the James River, a water source originating outside the local watershed. In his public announcement, RWSA Executive Director, Thomas Frederick stated, "You told us many ways, many times, that you wanted to stay within the watershed. To stay within the areas where the land use is controlled by the local officials, and that's what this alternative provides to you." 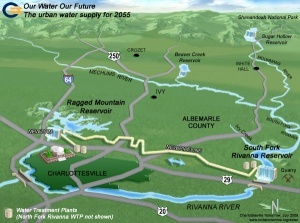 On September 20, 2010, the Charlottesville City Council voted to re-affirm the basic components of the water plan, but to modify it to build a new dam in phases, either through the repair and extension of the existing Lower Ragged Mountain Dam, or by building a new dam downstream, as well as conducting dredging of the South Fork Rivanna Reservoir as a separate project. After a meeting of the four boards held in September 2010, the RWSA sent a letter to Scott Kudlas of the Virginia Department of Environmental Quality seeking advice on how to proceed with potential amendments to the plan. This section will document other water supply plans considered after the construction of the South Fork Rivanna Reservoir up until the approval of the 2006 water supply plan. "The search for an additional source of water to meet long-term water demand in the Urban service area began as far back as the early 1970’s. Two studies completed for RWSA in the 1970’s (Malcolm Pirnie, 1972 and Camp Dresser McKee, 1977) developed and evaluated a number of primarily structural alternatives including various new impoundments, a new river intake, and expansion of the South Fork Rivanna Reservoir." Land was purchased by Albemarle County for a reservoir in 1969. This is now known as Preddy Creek Park. Studies in the 1970s determined there was insufficient water supply for a reservoir at this location. Land was purchased by Albemarle County in Free Union for a reservoir during 1980s and 1990s. That site has since been deemed unsuitable because of permitting obstacles related to the endangered James River Spiny Mussel (James Spinymussel / Pleurobema collina). "Based on the factors that were considered at the time, construction of a new impoundment on Buck Mountain Creek was determined to be the best option for a new water supply. And, based on this conclusion, RWSA initiated the process of acquiring property on Buck Mountain in anticipation of building a new reservoir in this location. Subsequent studies in the 1980’s focused in greater detail on design aspects associated with the proposed Buck Mountain Reservoir, looking at various dam locations and dam heights. RWSA proceeded with the planning and design of Buck Mountain Reservoir through the mid 1990’s and by that time had acquired all of the land necessary to build the proposed reservoir." "In 1996, RWSA retained Vanasse Hangen Brustlin, Inc. (VHB) and O’Brien and Gere, Inc. (OBG) to prepare and submit the necessary permit application for Buck Mountain Reservoir. As part of that effort, a wide range of potentially feasible alternatives were developed, including alternatives that avoided impacts to Buck Mountain Creek and tributaries totaling more than 60,000 linear feet of stream channels including habitat for the James Spinymussel. In order to take a comprehensive look at avoidance measures, the alternatives analysis process that began in the 1970’s was re-opened." "In 2000, a new alternatives analysis report was issued (VHB, 2000) that evaluated over 30 concepts. These alternatives included both structural and non-structural options including water conservation, regional cooperation, growth management and demand management, dredging of existing reservoirs, crest controls on South Fork Rivanna Reservoir, re-use, various reservoirs, and surface water withdrawals." In the all of 2003, the permitting process began on this plan while the impact of the 2002 drought was being assessed. When it became clear that the 2002 drought was now the worst drought of record (instead of 1930), the RWSA determined that the 2002 plan would not meet the community's water supply demand projections. ↑ Web. After years -- and hours -- of debate, City Council backs new dam, Graham Moomaw, Daily Progress, World Media Enterprises, January 18, 2012, retrieved June 25, 2012. ↑ Web. RWSA BOARD OF DIRECTORS, Minutes of Regular Meeting, May 22, 2006, Rivanna Water and Sewer Authority, retrieved October 26, 2010. ↑ Web. Federal agency grants permit for new dam and pipeline, Sean Tubbs, Charlottesville Tomorrow, June 3, 2008, retrieved August 29, 2011. ↑ Web. 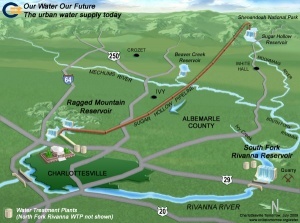 Community Water Supply Plan receives state approval, Sean Tubbs, Charlottesville Tomorrow, February 13, 2008, retrieved August 29, 2011. ↑ Web. Re: Virginia Water Protection Permit 06-1574, Thomas L. Frederick, Rivanna Water and Sewer Authority, retrieved November 12, 2010. ↑ Web. RWSA to advertise bids for new Ragged Mountain dam, Sean Tubbs, Charlottesville Tomorrow, October 26, 2011, retrieved November 18, 2011. ↑ Web. [http://www.cvillepedia.org/mediawiki/images/20111028-Ragged-Mtn-Dam-Prequalified-Contractors-List.pdf New Ragged Mountain Dam Albemarle County, VA List of Prequalified Contractors October 28, 2011 – Revised November 9, 2011], Rivanna Water & Sewer Authority, November 9, 2011, retrieved November 18, 2011. ↑ Web. STATUS REPORT: ON-GOING PROJECTS, Thomas L. Frederick, Rivanna Water and Sewer Authority, retrieved June 25, 2012. ↑ Web. TAKING A CLOSER LOOK AT THE COMMUNITY WATER SUPPLY PLAN, Albemarle County, retrieved October 14, 2010. ↑ 11.0 11.1 11.2 Community Water Supply Project Permit Support Document, Rivanna Water & Sewer Authority, 30 June 2006. This page was last edited on 28 June 2012, at 15:22.